Hang onto your seats! Talk about twists and turns! US Marshal Jack Dillon, assigned to An Garda Síochána, Special Branch is searching for a missing American student, hoping she she just took off to see Paris or Rome. But deep down, he knows . . .
Madeline was in a Dublin pub listening to music. Now she's missing . . .
5.0 out of 5 starsThe most recent Marshall Dillon is highly entertaining. Another highly entertaining Marshall Dillon tale. As you undoubtedly know by now, Jack is a US Marshall on (permanent) loan to Dublin. He and his partner Paddy Suel see all sorts of action. On the miner plot action, we have a common thief who they can't seem to catch no matter what they try. Much more serious the Paddy's sister getting brutally raped and beaten and she refuses to tell Paddy who the guy is that did it. The main emphasis, though, is on Madeline, an American college student attending university in Dublin. She has gone missing and it is 4 days before it is even reported. Clues are few and far between. When they finally settle on some suspects, they all have air tight alibis. As with the previous books in this series, Mr. Faricy has created another excellent read. 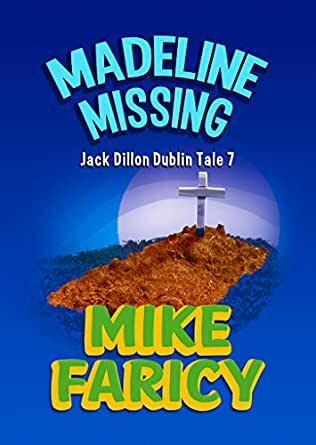 Madeline Missing is truly one of those books this reader hated to put down just to do the mundane things in life. I highly recommend this as well as all the books in the series. I did not fine the novel to be humorous this time. However, I do enjoy a novel with humor and Jack Dillon character can carry out this task. Mike Faricy, I know you have a creative humorous side to your writing . . . next release please give me more LOL . Worthy read. 5.0 out of 5 starsThe Marshal comes out on top .. again! Once again the American Marshall wins again. I suppose we should acknowledge the assistance of both the Dublin and Belfast law enforcement ... just as the Marshall does. A decent story! A slow, steady read. The story of a college student gone missing. US Marshall Jack Dillon along with his partner, Suel, are tasked with finding her.